Cherry Pitters - Free, Easy Recipes @ FoodCult.com - A Place for Galganov&#039;s Recipes and More - Food Matters! Removing pits (or "stones") from Cherries is a tedious task at best. There are all sorts of ways - from cutting them open with a knife and cutting or prying away the stone (the way we did it the first time) to using a bobby pin (we've never done it that way but have heard of the technique). The easy way, though, is using one of the many cherry pitters - also known as a "cherry stoners" on the market today. Of these, there are many types - two of which are pictured here. 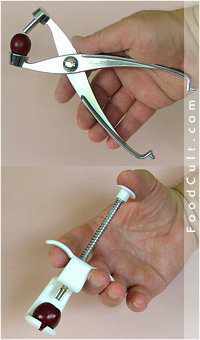 The first operates as a "scissor" or pair of pliers where you place the cherry in the cradle - in the jaw. When you squeeze the handle the post pokes through the cherry pushing the cherry pit out the bottom. The other is a simple plunger device where the pitter is held between the index and middle finger with the fins resting on those fingers. The plunger is depressed with the thumb. The cherry is placed in the cradle below the post. When you press on the plunger the post, as with the scissor type, pokes through the cherry pushing the stone out the bottom. Both types are, typically, spring loaded and are open in their natural state. They are both easy to use although the post on this particular plunger-type cherry stoner is a little narrow and, depending upon the cherry, may miss the stone (slide by the pit) a little more often. In both cases, practice (repetition) makes perfect. The plunger-type (the white one) is a little easier to use if your hands are smaller. Cherry stoners are also useful for pitting olives although we have had no luck trying to pit olives with the plunger-type shown here (other plunger-types may work better on olives). The key issues of which to be mindful are: smaller olives by slide through the cradle when trying to remove the pit. Also, olive pit ends are very sharp and can hurt if pushed through the olive into your hands or finger. A final note on pitting olives: Green (unripend) olives are hard and the olive will almost always break if pitting with one of these devices. Pitters are more effective on ripe (black) olives.